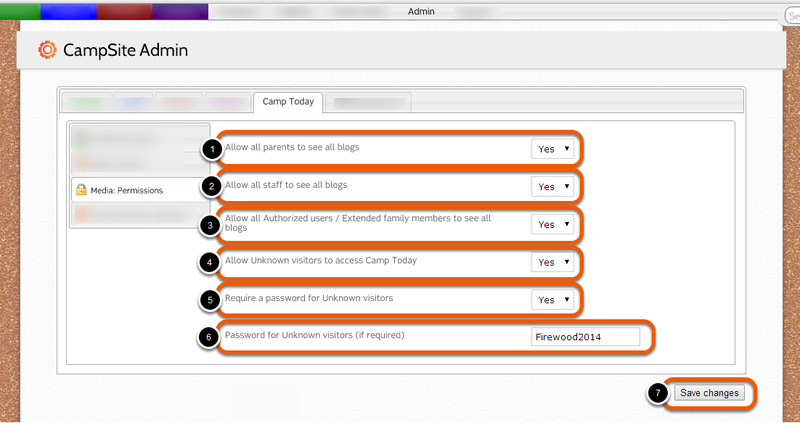 Setting Camp Today Media Permissions allows you to control the blog posts users can see. Camp Today Media Permissions can be controlled by going to Admin > Camp Today > Media: Permissions. Select whether or not you would like parents to see all blogs. If this is set to "No", parents will only be able to see blogs that include the sessions their campers are enrolled in. Select whether or not you would like staff to see all blogs. If this is set to "No", staff will only be able to see blogs that include the sessions they are hired for. Select whether or not you would like Authorized Users and Extended Family members to see all blogs. If this is set to "No", they will only be able to see blogs that include the sessions the campers they are associated with are enrolled in. Allowing Unknown visitors to access Camp Today allows users to access your Camp Today blogs by visiting yourcamp.campmanagement.com/camptoday.